Posted November 23, 2018 . 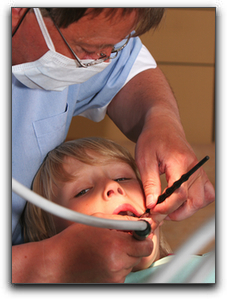 At Distinctive Dental Services, we know that many Lake Jackson children are afraid of going to the dentist. Our staff at Distinctive Dental Services wants to make your child’s first visit to our practice a positive experience because regular dental check-ups from a very young age are an essential part of oral hygiene. Texas parents can follow these guidelines to help prepare their child for a dental visit. 1. Talk about the exam with your child. Answer any questions with uncomplicated answers. 2. Don’t share your bad dental experiences with your child. 3. Don’t imply that the exam will be painful. 4. Help your child understand that this is an important part of staying healthy. 5. Don’t offer a reward for visiting the dentist. It is important for parents to make sure they aren’t anxious about Lake Jackson dental visits because children can sense their stress. At Distinctive Dental Services, we have been treating children and adults since 1998. Our professional, friendly staff can calm the nerves of a fearful child and help them have a gentle dental experience with sedation dentistry in Lake Jackson. If you or your Lake Jackson child has had a bad dental experience or is unable to stay calm while visiting the dentist, ask us about sedation dentistry in Lake Jackson. We want all of our patients to feel as comfortable and relaxed as possible while receiving excellent dental care. For simple dental procedures, topical anesthetics are applied to the gums and other tissues reducing oral sensation. If you require sedation dentistry in Lake Jackson, nitrous oxide and general anesthesia are safe solutions. Distinctive Dental Services also offers complete smile makeovers which may include dental implants, teeth whitening, dental veneers, or any other cosmetic dental procedures required. All of these can be done with some type of sedation. Don’t let your fears or your child’s fears keep your child from having a beautiful, healthy smile. Contact Distinctive Dental Services at 979-297-0337 today and schedule your appointment. We look forward to hearing from you. Please call: 979-297-0337 or fill out this simple form. What Happens If You Keep Using an Old Toothbrush? Dr. Scott Elrod and his team at Distinctive Dental Services in Lake Jackson, Texas, love helping their patients have beautiful, healthy smiles with cosmetic dentistry, dental implants, orthodontics, general dentistry and so much more. They also offer sedation dentistry to patients who have dental anxiety or need extensive dental work done in a single appointment. They serve patients in and around the Lake Jackson area, including the communities of Angleton, Clute, Brazoria, Sweeney and Pearland, TX and zip codes 77422, 77480, 77515 and 77566. Copyright 2019 © Distinctive Dental Services. All rights reserved.